If only the first roach listened to that second roach…then maybe we wouldn’t have such a roach predicament every year! Roaches are the worst and you tend to notice them at the worst times. Whether you are just hopping out of the shower, climbing into bed, or entertaining your neighbors with a dinner party, those creepy crawlers come out and send goosebumps up and down your spine. 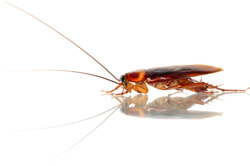 Roaches are nasty scavengers and even the cleanest of homes can still have a roach infestation problem. So when this happens to you, Eco Tech is here to help! As a premier pest and animal control company in Minnesota, we offer both traditional and all natural methods to getting rid of your roach problem. Do you think we are being dramatic here? Think again. If you spot a roach in your home, it is very likely that there are many, many more growing in numbers even as you are reading this! Roaches have an incredible rate of reproduction which makes it very hard for homeowners to get rid of them without professional help. These suckers can enter your home through vents, sewer pipes, and even the smallest cracks and crevices throughout your home. Opening your purse or pulling out your shoes and finding a nice, fat roach is just the icing on the cake. So why can’t you just go buy some spray at the local hardware store and call it a day? Don’t even waste your money. Roaches have the ability to lay eggs that are protected from insecticides. So not only are they hard to spot and incredibly fast, their offspring will be quickly invading your home, whether you spray or not. Our team at Eco Tech is well trained in roach pest control. We have the proper equipment and materials to get these roaches out and leave your home pest free. Our formula is a less toxic organic pest treatment that will exterminate the roaches while also keeping your family and even your pets safe at home. So if you happen to crunch down on a nasty roach, call Eco Tech today, Minnesota’s best pest control solution! Contact us today at 763.785.1414.